Jackson's chameleon (Chamaeleo jacksoni) . Flicked out in 1/25 second, a chameleon's tongue tip is sticky and partly prehensile, giving the insect victim no chance. In locating food, the eyes swivel independently until prey is sighted, then focus together. Another remarkable characteristic of this reptile is its ability to change color. Color changes are activated largely by changes in light, a signal from the eye passing via the nervous system to pigment cells into skin. Most chameleons are well adapted for climbing with toes fused and grouped to form grasping hands and feet. The toes have sharp claws. 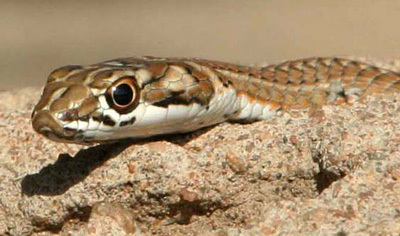 Karoo sand snake (Psammophis notostictus). The egg-eating snake (A) gulps eggs, cracks them, and rejects the shells. The boa constrictor (B) coils round its prey, suffocating it. The camouflaged fishing snake (C) seizes fish in its back-fanged jaws. 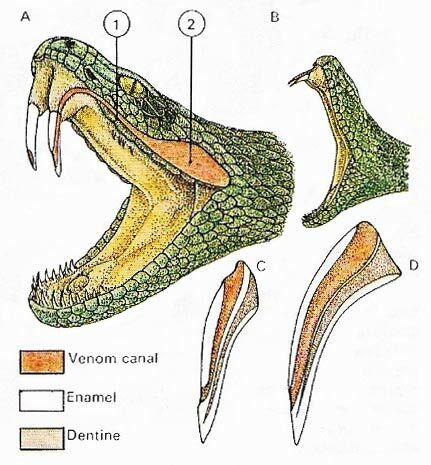 Snake venom is produced in modified salivary glands, delivered in certain snakes by grooved teeth. In rattlesnakes (A) and their like, venom is squeezed down a duct (1) from the venom gland (2) into a fang like a hypodermic syringe. The fangs are erected and the huge gape (B) becomes apparent as the snake strikes. Three kinds of cobra spray venom at their adversaries' eyes. Their fangs have forward-directed orifices (C), unlike the 'hypodermic' fang (D). The Squamata is an order of cold-blooded scaly reptiles, comprising the snakes (suborder Serpentes) and lizards (suborder Lacertilia). They are mostly terrestrial vertebrates that first appeared at the end of the Triassic period, about 170 million years ago. Members of the Squamata share many similarities despite the obvious differences between them. Lizards have five-toed limbs, while snakes are legless. Lizards usually have eyelids, visible external ears, and small scales under the belly as well as on the back. Snakes have no true eyelids, no sign of external ear openings, eardrums, or middle ears, and possess a single row of large scales along their bellies. Snakes detect sound vibrations through the ground. Their long, forked, protractile tongue is used to detect odors. Poisonous species have hollow or grooved fangs, through which they inject venom. Most lizards are carnivorous, feeding on insects and other small prey, but some larger species such as monitors prey upon vertebrates. They tend, like other reptiles, to spend much of the time immobile, waiting for the prey to approach before they grab it, or make short rush for it. Iguanas and some skinks are among the few vegetarian lizards. Camouflage and immobility are their main means of defence, but monitors use both claws and teeth to protect themselves and even small lizards may bite if cornered. Others protect themselves by autonomy – if harried they shed part of their tail at a special breaking point, leaving it behind to confuse the predator. A replacement is then grown. In movement, most lizards have a straddling gait. Many climb and the gecko, which has ridges and microscopic hairs under its toes, can walk on an apparently smooth ceiling. The flying dragon of southeast Asia is a lizard that glides using flaps of skin. 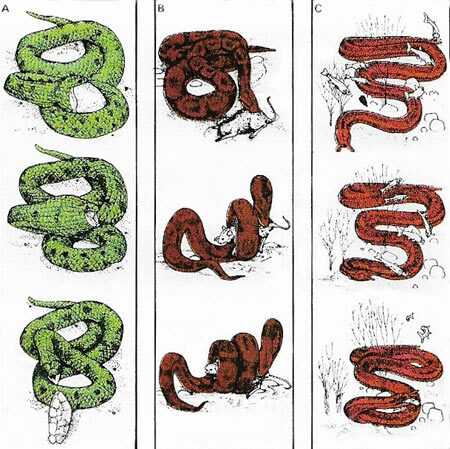 Most snakes move by bending their bodies from side to side using muscles along the backbone. The sides of their bodies grip the ground. Some species, however, have adapted to modified means of locomotion. All are carnivores, swallowing their prey whole. Jaws loosely connected to the skull and to one another permit an enormous gape, and allow prey much wider than the snake's head to be engulfed by 'walking' the jaws alternately round it. In this way 4.8-meter (16-foot) rock python has been known to swallow whole 59-kilogram (130-pound) impala, and an 8-meter (26-foot) anaconda a 45-kilogram (100-pound) peccary. Large snakes such as these suffocate their victims by construction, squeezing the air out of them. Others – a minority – have poisonous bites. The most dangerous of these are the two families of front-fanged snakes, the cobras, whose venom mainly attacks the nervous system, and vipers and rattlesnakes, whose poison affects the blood and tissues. The fangs of the Indian cobra (A) are at the front of its jaws, and well placed for delivering the venom. Back-fanged snakes such as the boiga (B) generally have smaller fangs. Venomous snakes, like others, usually flee before a threat, but some use a deterrent display – the cobra spreads its hood, the rattlesnake rattles its tail. The coral snakes have developed garish warning colors, but other non-poisonous species have developed near-identical color patterns as a defence.